What are dentures, exactly? Dentures are a restorative treatment, a removable dentistry tool used with excellent results to replace missing teeth and gum tissue. 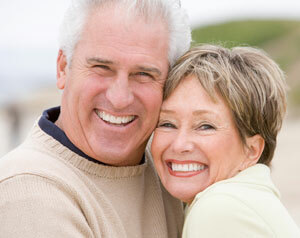 Dentures are crafted individually to resemble your teeth and keep you smiling. There are both complete and partial dentures, and they can be used when teeth or missing or damaged. Complete dentures may follow two lines for patient needs. Conventional dentures are made after teeth have been removed and gums have healed – in about four to six weeks following tooth removal. Immediate dentures are made in advance and placed for the patient after teeth are removed, with adjustments being made to fit a patient’s mouth once gum swelling has reduced and the gums healed. Dentures are durable and long lasting, and are an excellent tool in providing for patients who have a loss of teeth, improving a smile cosmetically, improving chewing, and speech capabilities. Prior to creating a patient’s unique denture, impressions and measurements are taken, and fitting appointments set up to assure our patients of a natural and comfortable fit.